Robert Downey Jr. posted a clip on social media of Captain America from the first Avengers movie where he's having a bit of trouble putting his parachute on. RDJ captioned the photo by saying, "This is what happens when they aren't designed by Stark." After the tweet went out, Chris Evans decided to respond. He had this to say. "I'm assuming you mean the parachute. However you DID design that costume, so I think they cancel each other out... Maybe the blame is rests more with Coulson. Either way, you still let me run around New York like that." The Captain America suit from the first Avengers movie is a little goofy looking, but it has changed over the years and evolved to look a lot cooler. Clark Gregg, who plays Agent Phil Coulson has yet to respond for being called out as the original designer. Whatever the case may be, Earth's Mightiest Heroes are all getting suit upgrades in Avengers: Endgame with the introduction of the new white tech suits, which have unofficially been dubbed Quantum Realm suits because they look so close to Hank Pym's tech. Steve Rogers and Tony Stark's relationship was at an all-time low in Captain America: Civil War, but it looks like things might be okay for the two as they work together to bring back half of the universe. 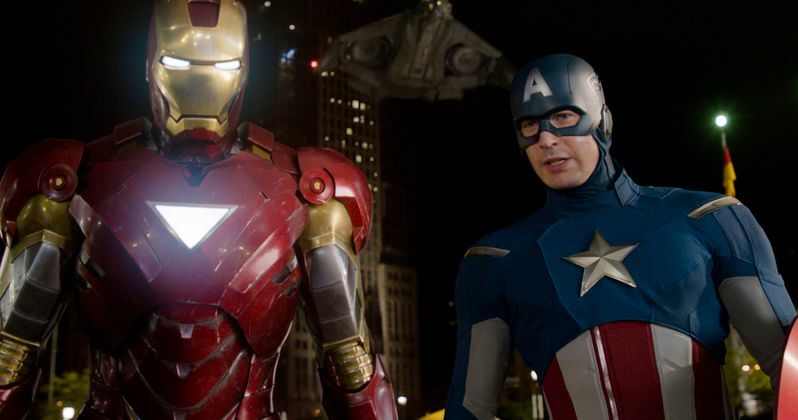 Marvel Cinematic Universe fans have been waiting to see Stark and Rogers reunite and it looks like Endgame may give us just that, according to one of the trailers. However, the Russo Brothers have been throwing dummy footage into the trailers, so what we have seen might not even be in the final cut when the movie hits theaters at the end of this month. Since the Avengers: Endgame promotional tour started, it's been fun to see the cast and crew interacting with each other, which might be the last time we see them all together for this kind of thing. They all seem like one big happy family and are excited for MCU fans to see the culmination of eleven years-worth of storytelling. It's a huge story and the Russo Brothers aren't letting anything out at this time. We'll have to wait until after the movie is released to get the reasoning for their decisions during the promotional campaign. You can check out the Captain America suit getting roasted below, thanks to Chris Evans' Twitter account.